Just because it's cold doesn't mean you can't have beautiful plants and flowers. 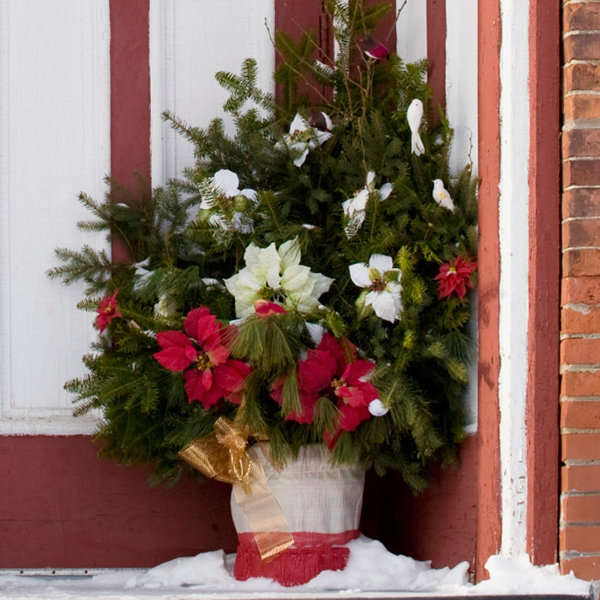 These Winter Container Garden Ideas will help bring some color to your home. Winter is here, and that usually means that those of us with a green thumb are stuck trying to find ways to stay busy while the ground is frozen. Never fear! 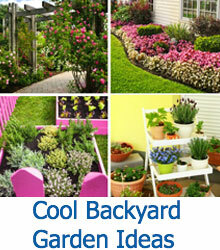 Container gardening and creating beautiful, colorful displays don’t have to take a backseat when it’s cold out. 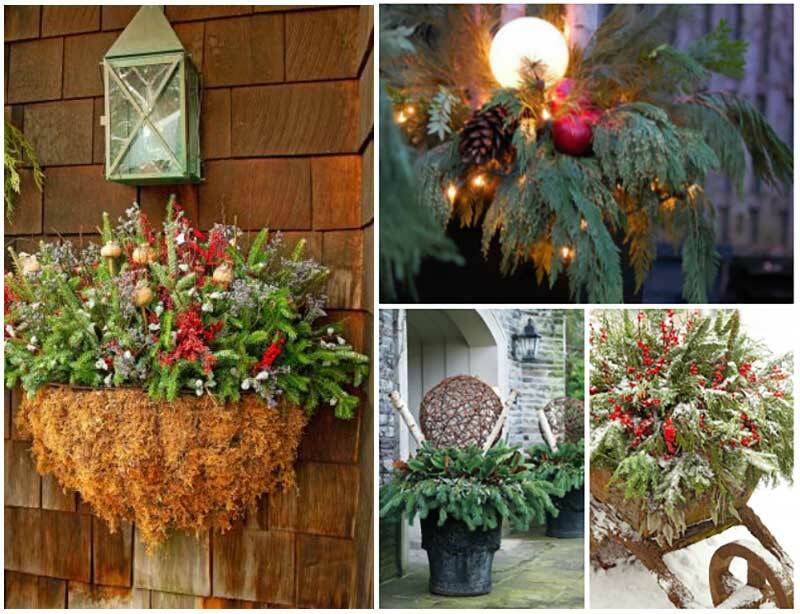 We’ve assembled some really fantastic winter-themed displays that are easy to assemble in your existing planters and pots. Once you’re done arranging, place these beauties in a prominent spot on your porch, steps, or even indoors if that’s what suits you. 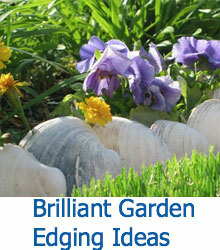 They’re sure to be a welcome respite from the gray days of winter ahead! These projects are designed for anyone from experienced DIY and gardeners to those brand new to the scene. While these plants are cuttings and won’t last past the winter, they’ll still be a bright spot in the cold weather, welcoming guests into your warm home all season long! We hope you’ll be inspired to bring some color to your winter yard! 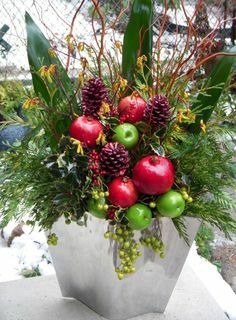 This lovely silver planter is bedecked with faux apples, burgundy pine cones, and a wealth of evergreen boughs. This display was created by adding winter-themed items to an existing display. If you’re using natural boughs, be sure to purchase and spray your branches with a product like Wilt-Pruf, which will keep your boughs looking nice and fresh throughout the season! This humble, yet beautiful display was created by adding moss and florist’s foam to an existing wire wall container. Fraser fir boughs, dyed eucalyptus, purple caspia, and winterberry holly come together to make a densely packed and festive decoration for a small wall near the doorway. This planter gets added height by adding a second plant on top of the previously potted one. The soil line is covered by the drooping evergreen boughs a by the large, colorful red and white poinsettia blooms. 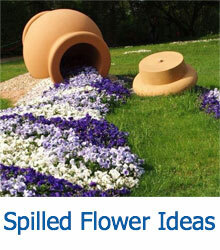 The plan planter is dressed up with sturdy fabric and gold ribbon. Wonderfully festive! This contemporary beauty is heavily influenced by the sleek black planter it’s based in. This display was created with hefty birch branches and evergreen boughs from several different varieties of trees. 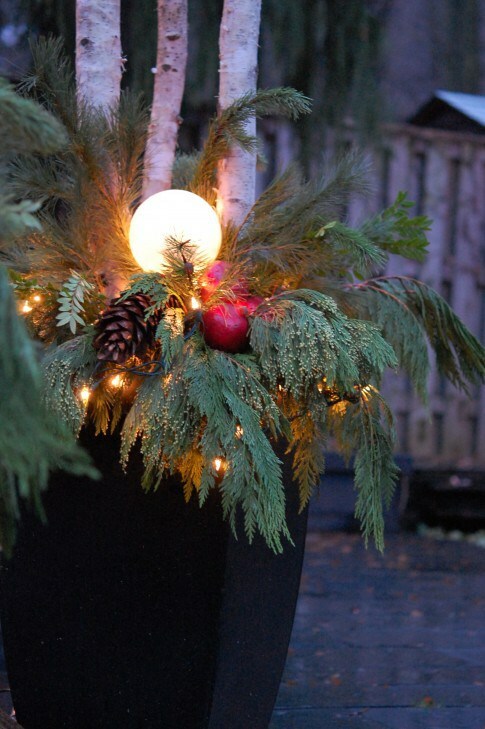 Pine cones, apples, and even a small lighted globe transform this piece into a planter that is as beautiful at night as it is during the day. 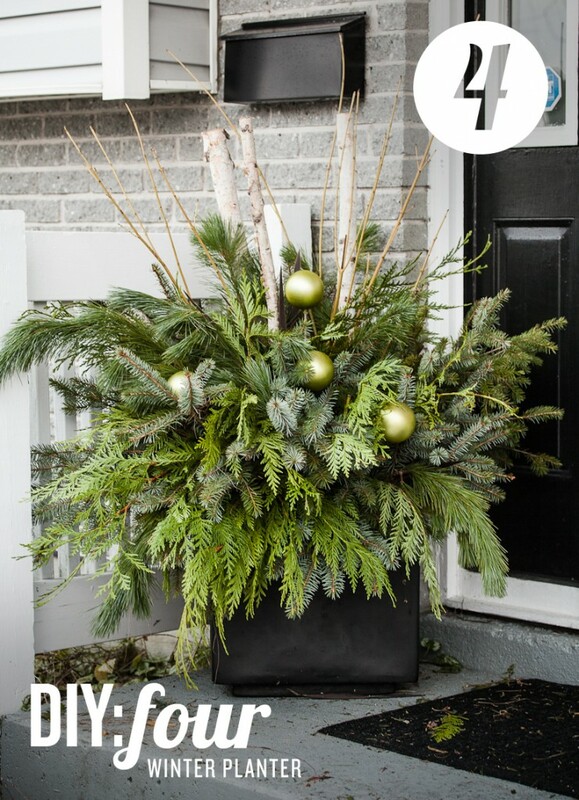 This is a simple, yet wholly festive display that is great as a centerpiece inside or outside on a table or to the side of the steps. The vintage wooden box is filled with pinecones, evergreen boughs, and sprigs of winterberries and holly for color. You’ll need to arrange this piece with floral foam and tape. Feel free to make your display utterly unique with small accents. 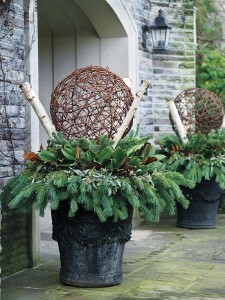 These planters are stuffed with tiers of evergreen sprigs and boughs, with a set of birch branches forming a “v” for the large wicker ball to sit on top of. Simple, but effective and totally gorgeous! 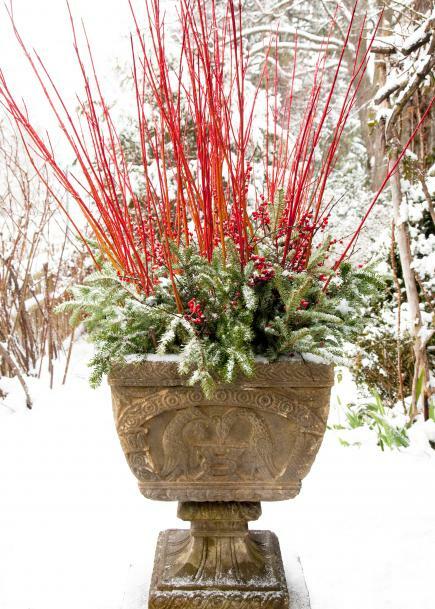 These bold red sticks are cardinal dogwood, which are matched with Fraser fir boughs and a healthy dose of winterberries. The result is a definitely traditional outdoor display that is steeped in classic design and adds a burst of color to the white landscape. 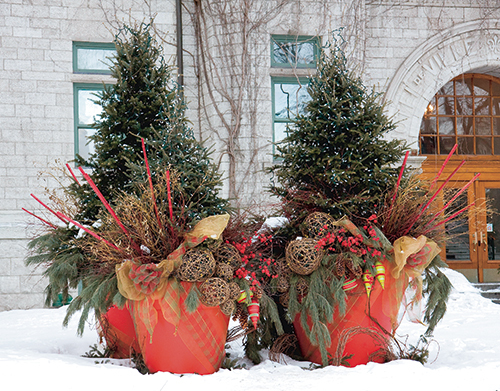 This display was created using two miniature fir trees and large red planters. 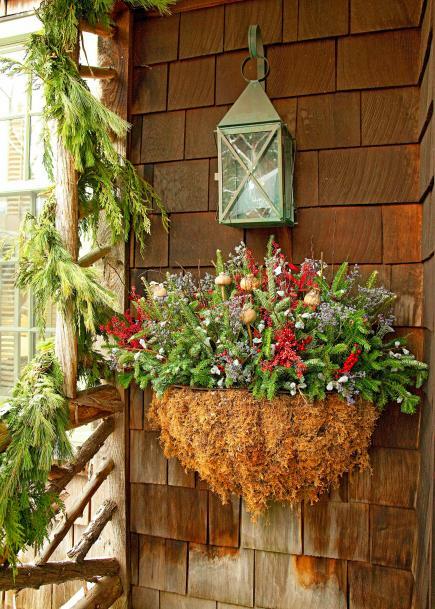 Each planter is wrapped in a festive plaid ribbon and the fronts are heavily loaded with loose boughs, red sticks, wicker balls, and plenty of winterberry sprigs. These are great if you’re looking for a taller display. Wheelbarrows are a lovely outdoor display in the summer, but they can pull double duty for winter as well! 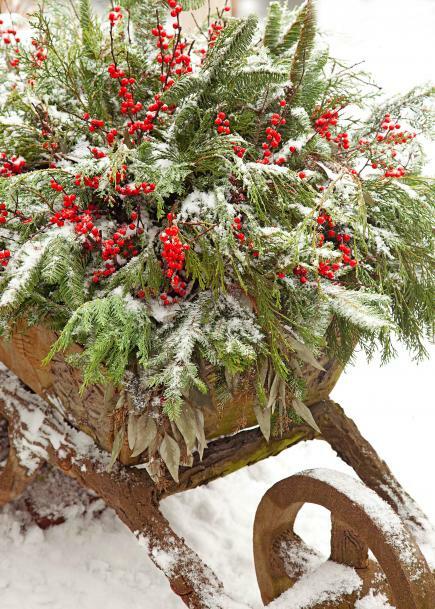 Fill your wheelbarrow with thick boughs and sprigs of holly or winterberry. A gentle frosting of snow, as shown on the example really makes the scene. Use topsoil when adding the boughs, as it is thicker and heavier and will keep the boughs in place much better! While this display doesn’t have the bold reds of other displays, the different shades of green present between the boughs of evergreen and the metallic christmas ornaments are all the dimension this subtly beautiful display needs. A few sticks and birch branches round out the design. 15 Nifty Plants Rabbits Won’t Eat: Defend Your Garden! Did you know that Diapers Can Help Your Plants Grow?